Ashley is one amazing cook – she’s always finding recipes and tweaking to make them better or just coming up with some delicious meals and snacks on her own. 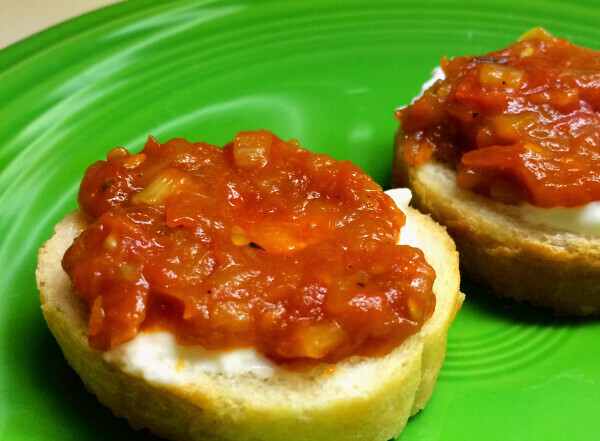 Today she’s sharing her recipe for tomato + fennel jam, one of my all-time favorite foods. It’s great as a snack with some burrata or mozzarella cheese, as a topping for meatloaf or chicken, and even as a condiment on a fancy grilled cheese (all of which I’ve tried with much success)! I am NOT a fan of tomatoes, or raw fennel. Licorice, ew. *shivers* However, this past summer, Misty told me about one of her favorite appetizers from a local restaurant. After reluctantly trying it for myself (hey! it came with cheese and bread! 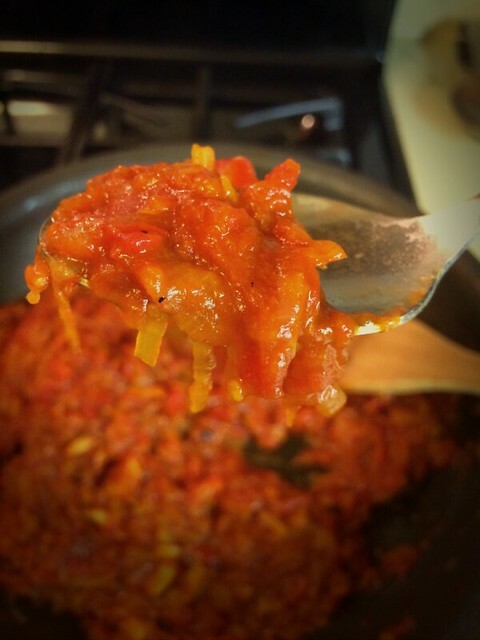 ), I attempted to create my own tomato and fennel jam. I checked out a few recipes online for inspiration and here’s what I came up with. Enjoy! Heat a large saute pan on medium/high heat with olive oil (or your choice of fat). 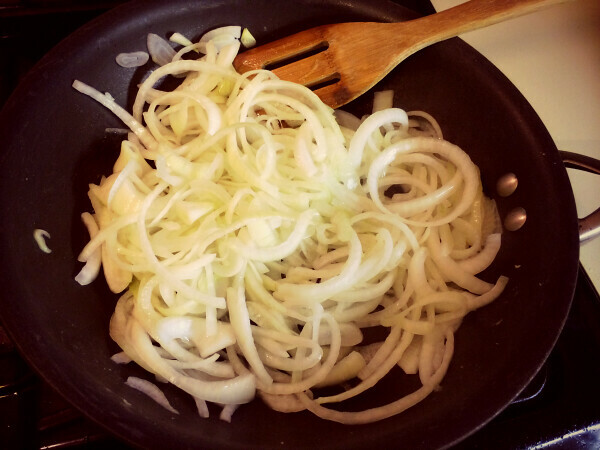 Slice the onion in to thin rings and add it to pan. You can try other kinds of onion, but I like the sweetness from vidalia. 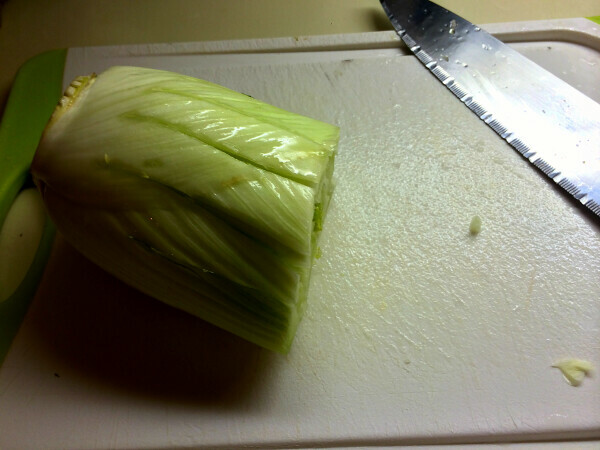 Dice the fennel bulb (not the stems) and add it to the pan with the onion. Add garlic cloves, salt, and pepper. 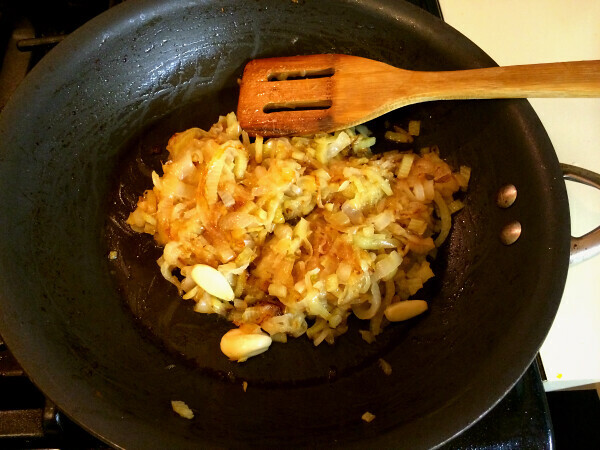 Saute 45-60 minutes on low/medium heat, stirring every 8-10 minutes while the onions caramelize. Turn down the heat if it begins to brown too quickly. While the mixture cooks, cut your tomatoes in to halves or quarters. I did attempt to fire-roast mine since I have a gas stove, but after about finishing 3-4 tomatoes I decided it wasn’t worth my time. I used campari tomatoes. I’m planning to try this with roma and cherry tomatoes next time. Let me know if you try another kind! 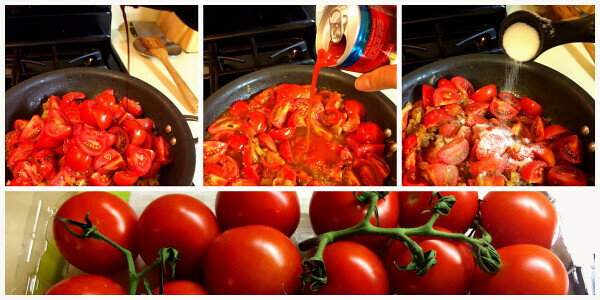 Once your mixture has caramelized, add the tomatoes, vinegar, sugar, and tomato juice to the pan. Bring everything to a boil, then turn the heat down to simmer until it thickens. This should take 45-60 minutes, stirring occasionally. Voila! 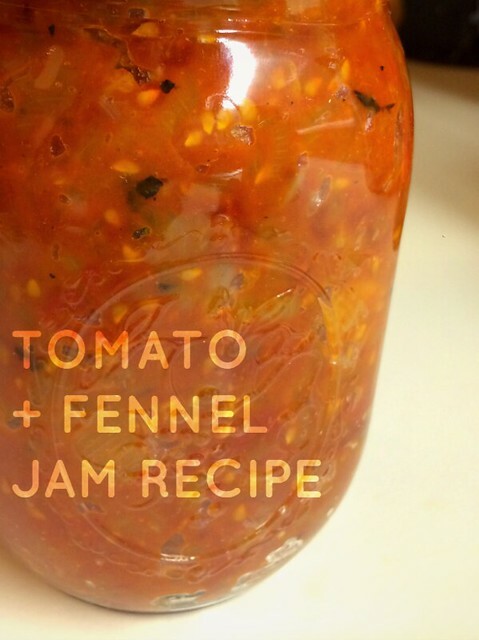 You now have an awesome tomato and fennel jam that fills a regular mason jar. Can you believe all of those veggies fit in one jar? Please share any comments, suggestions, or reviews of this recipe!